At Strawberry Hill Jamaica – just relaxing ! 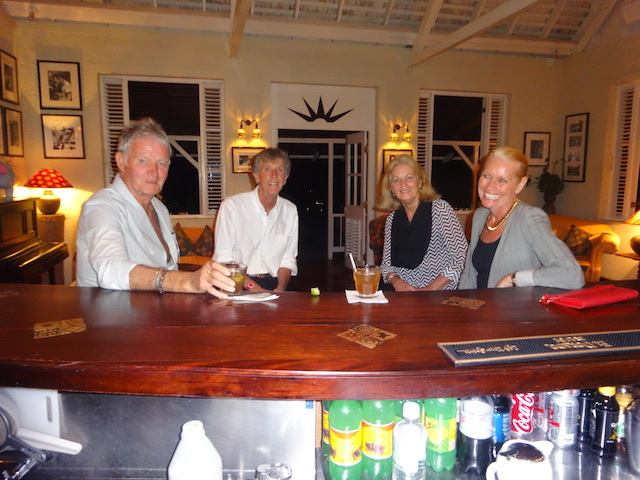 So here we are having a wonderful long weekend at Strawberry Hill in Jamaica – just relaxing …. Our dear friends Clemens and Nancy von Merveldt have been seduced back to Chris Blackwell’s Island Outpost Hotel group to manage the amazing Strawberry Hill Hotel in the Blue Mountains of Jamaica. The setting is so spectacular it is hard to describe – set on a hilltop overlooking Kingston to the west and more of the Blue Mountains to the north it is one of those landscapes that makes you smile wherever you look. The landscaping and planting are mature and so beautiful that you cannot resist just one more photo of a blossom or palm…. The hotel – like the other Island Outpost hotels has a casual and laid back vibe – which is very difficult to achieve given the demands and expectations these days of many hotel guests. There are, thankfully no TV’s in the cottages – there are a total of 13 cottages set in the 26 acre site. It has been a hotel since 1994 – but Blackwell has owned it since 1972 and throughout the 70’s and 80’s it was a famous meeting place for both Jamaican and international musicians including of course Bob Marley who was bought to prominence by Blackwell and Island records. Throughout the cottages and public spaces there are a superb range of photos of the great and the good – and bad ! – of the music world along with some covetable pictures of local Jamaican residents. All the cottages are built in a beautiful Caribbean colonial style with dark wood floors and furniture and white or off white walls. There is stunning fretwork in each cottage – all done by local artisan craftsmen…. The beds are high off the ground – almost at window level so that the breezes can reach you as you lay in bed. The linens are fabulous ! – as many of you will know I have a bit of a thing about laundry – given the amount I do for Governors Estate – so it was a real treat (sad I know ! ) to be able to visit the laundry and see their set up !! Most impressive for me was the huge industrial linen press for ironing all the sheets and duvet covers along with what seems like hundred of white dinner napkins. While we were there I took a yoga class at 9am one morning – great teacher – Sienna – who works for the Island Outpost group along with 4 other ladies – check out the picture of the yoga pavilion and the view…..
Other activities we managed to fit in between eating 3 meals a day and reading were a trip to a local coffee plantation called Clifton Mount – up another 2000 feet to an altitude of 5000 feet above sea level – very interesting and we managed to bump into the owners Richard and Jason Sharp. Leaving the Redlight area !! Sunday morning we took a downhill hike from Redlight – great name !! – to Gordon Town – it took us about 2.5 hours and thank goodness we had a taxi waiting to take us the winding road back up to Strawberry Hill and a delicious Jamaican brunch…..
Orville the barman making another rum cocktail ! Inspirational people for me ……..
What a vicarious vacation I just enjoyed through your visit to Strawberry Hill! The fretwork is beautiful, as is the hotel. You both look marvelously happy! Your visit to Strawberry Hill brought back fond memories of a bygone year. We stayed there on our honeymoon during 1968. Nice pictures we recognized but why not the one of Fort Newcastle with all the fruit trees in front and the mountains behind? The night time view of the Kingston skyline has not changed. We drove up and over the mountain crossing the Fort Newcastle Parade ground to reach Buff Bay on the north coast before continuing on to Port Antonio. The Moffetts were the long time owners when we stayed there. The visitors book – 21st January 1968 would include our name and that of the Diefenbaker’s ( very well known Canadian politician) on the following day. Very happy to see the home has been rebuilt after it was devastated by a hurricane. What a lovely personal story….. Funnily enough we had the current managers of Strawberry Hill here in Governors Harbour for a week and I told them about your comment. Unfortunately the guest book that your names would have been in has long been lost in the mists of time. Sounds like we need to go back and get some more photos !! Thanks for sharing your story…..